My first sound vision after listening to Heavy Water Experiment's debut disc of psychedelic prog rock is that of a 1960's acid-tripping Nektar concert in San Francisco. The band performs in front of a huge glimmering screen of colorful undulating amoebas and transparent lava globs and tries to usher their audience into an altered state of consciousness. Yeah, I'm that old, and that is mighty freaky stuff. But psychedelic and progressive are only two of the many words that you could use to describe NWE's music. In many ways, they are unclassifiable: their music is airy, atmospheric and appropriately spacey as anything 60's psychedelic or 00's ambient (Goldenthroat or Oracles). Often its also slow, plodding and methodical with doomish, but not quite sludge, elementals (Mirror In The Sky or Clairvoyance. Sometimes its bright and lively (Neverlove) or versatile experimentalism (Conflagration Song, Octavian), or quaalude meets mescaline trippiness (Otherland, Book Colored Blue). Mostly, however, it's inaccessible, a self-absorbed foray into musical naval gazing. But it's never dull. That is, of course, if you're in the right frame of mind. But, now we're begging the question. 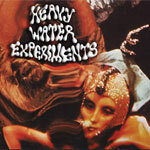 Heavy Water Experiments is a huge dose of unclassifiable sedation-inducing psychedelic progressive rock which is best characterized by a suspicious inaccessibility and the authors' own musical self-absorption. But it's never dull. Recommended! Heavy Water Experiments is a huge dose of unclassifiable sedation-inducing psychedelic progressive rock which is best characterized by a suspicious inaccessibility and the authors' own musical self-absorption. But it's never dull.